In this tutorial, I want to share my essential tips to improve your photo editing using Layer Masks in Photoshop. Working with Layer Masks in Photoshop is possible the most powerful editing technique you can use. Mastering this will literally unlock adjustments that you might otherwise have thought were impossible. Creating and editing layer masks in Photoshop is a huge topic that could fill several large books. We can never do justice to the subject in a single tutorial. For this reason, my essential tips are based on the most common problems I hear when I speak to people. 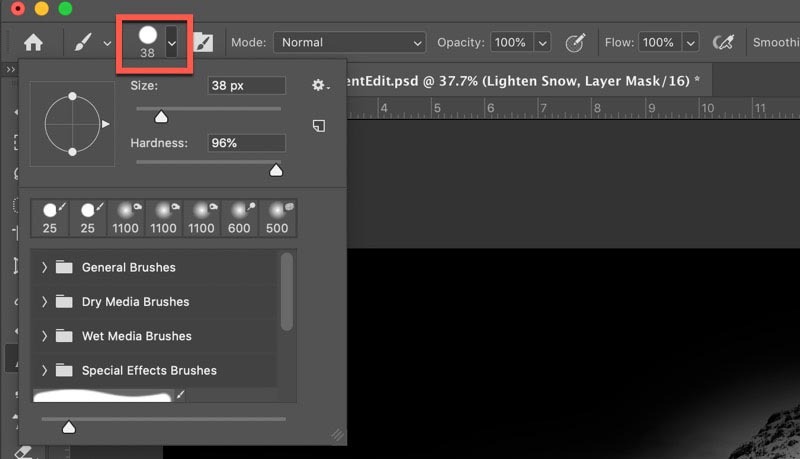 Photoshop uses Masks to control which areas of an image an adjustment applies to. We call them Layer Masks because they attach to Adjustment Layers which we use to edit our images. At this point, we need to take a small diversion because of another common problem. The way a lot of people learn to work with Photoshop is by reading books and experimenting with adjustments. Typically, they start by using the “Image” menu in Photoshop where they find the different Adjustments. The problem with this approach is that it applies the adjustments directly to the image and you can’t subsequently change them. If this is your approach to editing, stop it now. You should apply all image adjustments like Levels, Curves and Saturation using an Adjustment Layer. You will find these in the “Layer” menu under the “New Adjustment Layer” section. When you add an Adjustment Layer to your image, it appears as a new layer in the Photoshop Layers Window. There are lots of benefits to this editing approach like being able to change the Opacity of the layer to adjust the strength of the effect. It also gives you access to powerful Blending Modes and most importantly you can add a Layer Mask. You can see the Layers Window indicated in the screenshot below. If we take a closer look at this Layers Window (see below) you can see two of the Adjustment Layers have black and white Layer Masks attached to them. We use these Layer Masks to control where the adjustment’s applied to the image and where it’s blocked. If you want to view the Layer Mask attached to a layer you can hold down the Alt key (the Option key if you’re using a Mac) and click the layer mask in the Photoshop Layers Window. Here’s what the Layer Mask attached to the “Lighten Snow” layer looks like. 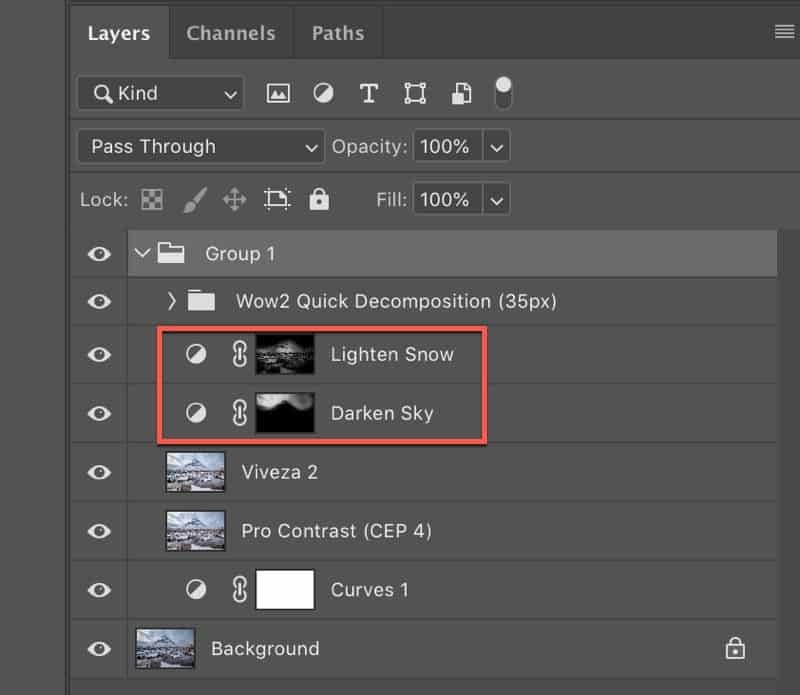 If you’re now wondering how this Layer Mask works, it brings us to our first tip. If you’re relatively new to using Photoshop Layer Masks, you may find it difficult to remember how they work. Even people who have been working with them for a while sometimes forget. A useful rhyme to help you remember the behaviour of the layer mask is. You can think of the Layer Mask as covering your image. Where the Layer Mask is black it hides the adjustment effect of the layer it’s attached to in that area. 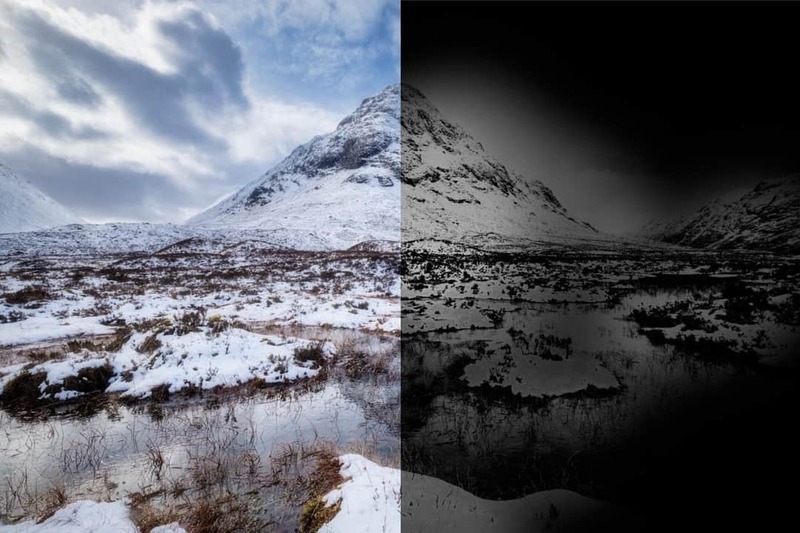 Where the Layer Mask is white, it reveals the effect at full intensity. If the Layer Mask is grey, you only partially see the effect of the adjustment. The strength of the adjustment depends on the shade of grey. The darker the grey, the weaker the effect whilst the lighter the grey, the stronger the effect. A common mistake made by a lot of new Photoshop users is trying to achieve everything with a single Adjustment. It should go without saying that you need to use Layer Masks to target your adjustments, but you don’t need to do this on a single layer. It’s usually much easier to work on small areas of the image at a time. Look back to the example of the Layers Window above. Notice it uses two Curves Adjustment Layers, one to Lighten the Snow and the other to Darken the sky. This is simple to understand and easy to work with. 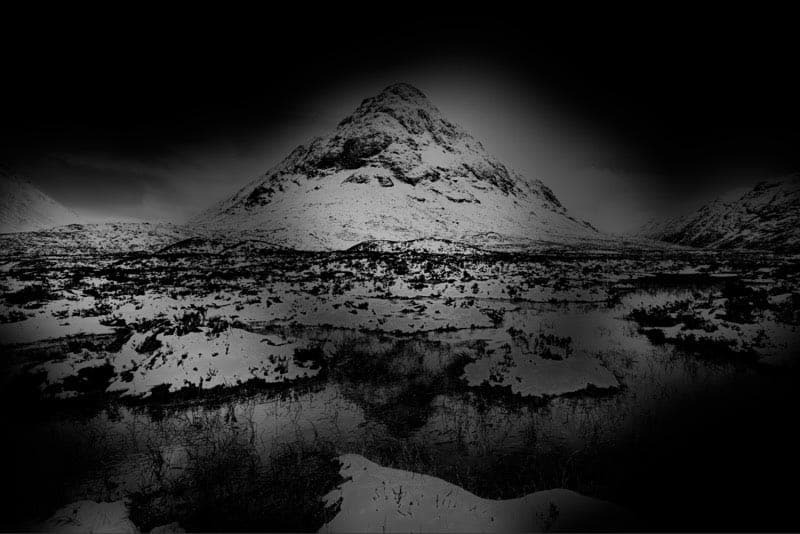 If after applying these changes you can add another layer to target another area of the image. And you can continue to add as many layers as you need, each adjusting a specific area of the image. When you build up adjustments in this way it makes editing easier and gives you greater control. Nothing looks worse in a photo than obvious adjustments. It’s sloppy and the mark of an amateur photographer. 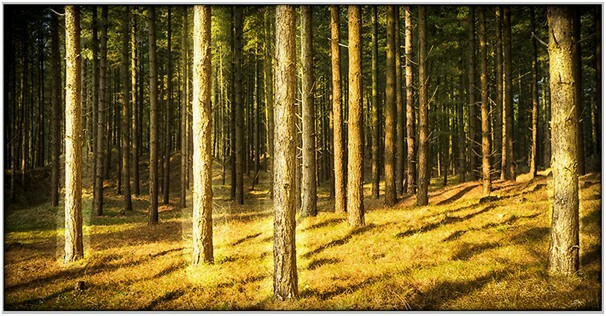 Here’s a typical (but extreme) example of trying to lighten the trees in the image using a painted layer mask. I’m sure you can find a few more examples if you browse Google Images. The way to avoid this type of mistake when painting your Photoshop Layer Masks is by using a soft edge brush at a low opacity. This requires you to make multiple brush strokes to build up your mask. As each brush stroke will most likely follow a slightly different path to the others, the effect will blend with the rest of the image. The soft edge of the brush also helps to blend the transition between the adjusted and unadjusted areas. To change the brush settings, first select the Photoshop Brush tool from the Tools Palette on the left of the screen. You will then see the settings in the Context Sensitive Toolbar on the left. You can see an example of this below. When you select the dropdown indicated above by the red square, you can set the size and hardness of the brush. You can ignore the size setting for the moment, there’s a better way of setting this. The important setting here is the Harness. When this is at 100% your brush has a very hard edge and your changes are easy to detect. Set it to 0% and the edge is very soft but gives less precision. Sometimes you will find even a soft brush is too harsh. When this happens, try applying a Gaussian blur to the Layer Mask. This will damage the precision of the mask, but it will help with the blending of an effect. What level of blur you need will depend on your adjustment and the image so it’s best to experiment using the preview option in the dialog. This isn’t a case of one adjustment setting that will work for everything. A good rule of thumb when editing images in Photoshop is to make all your global corrections first. After that, you can apply any local adjustments using Photoshop Layer Masks. Taking this tip further, when you begin to build up your layer adjustments, start by targeting the largest areas first. You can then work on progressively smaller areas of adjustment. This tip also works if you are painting an entire Layer Mask using the Brush tool. Start by painting with the largest brush size first and then gradually reduce the size to work on finer details in the mask. As mentioned earlier you shouldn’t use the Context Sensitive Toolbar to change the size of the Brush. Instead, use the [ and ] keys on your keyboard. You can use the [ key on your keyboard to reduce the size of the brush whilst the ] key will increase it. This allows you to position your brush next to the area you want to paint and the size it accurately. Also, don’t forget to zoom in to your image if you want to work on very small areas. If you want to affect larger areas, it’s best to zoom out. We’ve already mentioned that you can review your Layer Mask by holding down the “Alt” key and clicking the Layer Mask icon in the Layers Window. If you’re using a Mac, use the Option key and click. Repeat this a second time to return to viewing the image. It can be very helpful to view your Layer Mask from time to time rather than trying to see its effect on the image. By toggling the view of the mask on and off, it will help you create more natural adjustments that are difficult or impossible to detect. The final tip is perhaps an obvious one to finish but lots of people don’t bother with this. Think about it though. It’s easy to have an image file with 10 or more layers all making subtle adjustments. If you decide you need to make a further change to the layers and masks in the future, you might find it very difficult to remember what each layer does. Naming your layer to explain their purpose is a great help. It can help you avoid making errors as well as save you time in understanding what each adjustment does. I hope you found these tips helpful for working with Layer Masks in Photoshop. As mentioned at the start of this tutorial, we have barely scratched the surface of how to work with Photoshop Layer Masks. If you would like to learn more and improve your masking skills, there’s a free book available in the Members Area of Lenscraft. You can also find my comprehensive eBook “Mastering Photoshop Masks” in the Lenscraft shop. If you prefer a paper version of the book you can find this on Amazon.